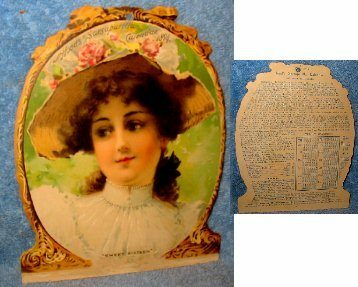 Calendar Top – 1894 Hood’s Sarsaparilla Calendar top. “Sweet Sixteen”. Calendar pad is missing from the bottom edge. Front is in nice shape. Backside has Astronomical Events and sarsaparilla info and is clean. Measures 5 1/5 x 6 3/4 inches. Find a damaged one with a pad and you’ll have a nice complete one.